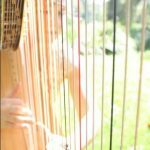 Elisa’s harp music adds a beautiful romantic touch to set the mood for one of the most important days of your life. 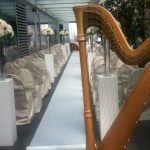 The harp offers a relaxing backdrop as guests mingle, an emotive atmosphere and creates seamless transitions during the ceremony. Every wedding is different and Elisa is happy to work with you to craft a personal musical accompaniment that perfectly compliments your special day. Drawing upon her classical, jazz, and pop repertoire Elisa will put together a light selection while the guests arrive and depart. Of course, she is more than happy to take special requests. For the processional and recessional, there are many traditional songs to pick from, or you can choose something a little different! Depending on your preferences, you can have a separate processional for the bride and the bridal party, or one for the whole procession. The recessional is best suited to celebratory songs, as it is the first time you will join hands and walk as husband a wife ! For the signing of the registry and any other point in your ceremony you would like musical accompaniment, Elisa can play a favorite from her collection or any special requests you may have. Elisa has a large repertoire of popular and jazz music perfect for your reception or cocktail hour. For a fun and classy option, check out her jazz/pop group Ladybird. I would just like to thank you for the beautiful job you did on Sunday. Hearing your music as I was about to walk down the aisle was enough to bring tears to my eyes, and I would like to especially thank you for learning to play Glasgow Love Theme. It is one of my favourite songs and I thought you executed it beautifully. I’m only sorry that I wasn’t around for cocktail hour to hear you play more! Thank you again, Brett and I were so thrilled!